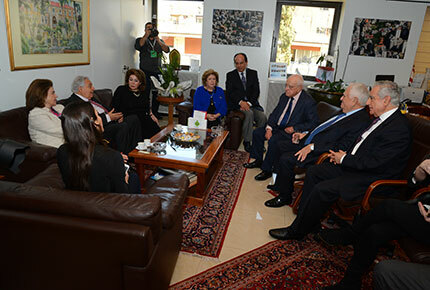 LAU names the School of Business in honor of Adnan Kassar, chairman of Fransabank, in return for a $10 million donation. President Kassar and President Jabbra sign the agreement. Prior to the signing ceremony members of the board meet in Dr. Jabbra’s office. Kassar believes that investing in education-related philanthropic activities contributes to helping youths improve society. At the event Dr. Jabbra praised Kassar for his significant role in both regional and national development. 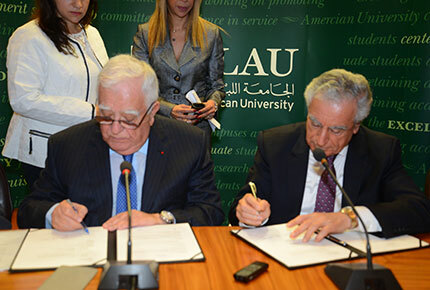 Kassar’s remarks came during a signing ceremony held at LAU’s Beirut campus on the occasion of his $10 million donation to LAU School of Business. 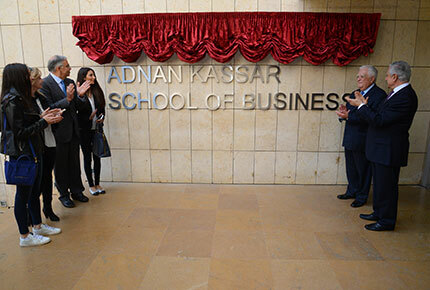 Earmarked for the purpose of naming the school the “Adnan Kassar School of Business,” Kassar’s donation is one of the biggest philanthropic investments in the university’s history. 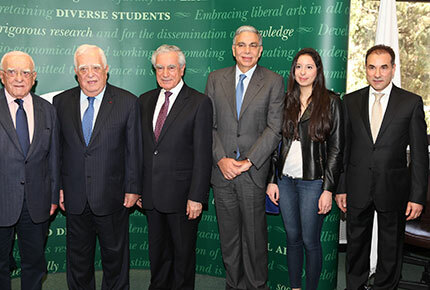 LAU President Joseph G. Jabbra thanked Kassar for his generous gift. “From today forward, every day will be Adnan Kassar’s day at LAU,” he declared. “LAU is indeed honored to be the recipient of this $10 million gift. His name on the School of Business will soar into the sky in the heart of Ras Beirut,” Jabbra added. 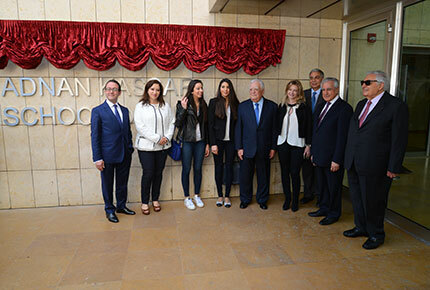 Following the signing ceremony and reception, Kassar and Jabbra unveiled a plaque inscribed with the school’s new name. Kassar’s investment in education-related philanthropic activities stems from his belief that such deeds contribute to helping youths improve society. “Education and specialization are essential for men and women to acquire knowledge that will help them contribute positively to society,” said Kassar. “This has been the main reason behind my keenness to offer scholarships to young bright students,” he added. His comments were echoed by Kassar, who said that he is dedicated to keeping Lebanon’s private sector united and distant from politics, to rising above challenges, and to safeguarding Lebanon from a political vacuum, wars and crises. The LAU School of Business is one of the oldest such schools in the Middle East and is an associate member of the Association to Advance Collegiate Schools of Business, along with the European Foundation for Management Development. It offers classes on both the Beirut and Byblos campuses and the university’s Executive Center at Solidere, in addition to the university’s academic center in Manhattan.